Bill's Movie News and Reviews: The Curious Life of Benjamin Button: I would love to be 18 again! The Curious Life of Benjamin Button: I would love to be 18 again! Who wouldn’t like to have the bod of an 18 year old again and the “wisdom” of a 65 year old? Maybe that's just vicarious identification. I recall once, in seventh grade, walking home from school and speculating with friends what it would be like to live backwards. As for me, I can imagine the panoply of events that I witnessed, regressing into better times and then eventually back to the days of McCarthyism. I can imagine watching my own body, although it would take decades for the right hair, on my legs and then my pate, to grow back, and then other hair, like chest, to disappear. The problem with Brad Pitt’s perfect character Benjamin Button at biological age 18 is that he already knows how much time he has life to live. That helps frame the storytelling experiment, David Fincher’s “The Curious Case of Benjamin Button.” (I think the word "Life" should have been used instead of "Case".) The short story (that makes a 165 min film) comes from F. Scott Fitzgerald, but the concept sounds more like it came from Oscar Wilde, perhaps with a touch of Dorian Gray. Pitt has worked for director David Fincher before, in 1995 with Se7en, where the script was changed when Pitt broke his arm. The film has a lot of CGI special effects and dawdles a bit, taking almost two hours to get to where he is no longer an old man – but one of the best scenes happens after the tug that he works on is “conscripted” into WWII and it destroys a German submarine. The outer story has Button’s life long love, who aged forward, dying in a New Orleans hospital as her daughter reads Button’s story, while Hurricane Katrina approaches. Early in the film, at biological age 65 or so, Button says he has never had an "experience"; same here. The opening of the backstory shows a badly deformed baby abandoned in 1918 New Orleams. Medically, the baby seems to have pregoria, but the child is “healed” by being slain in the spirit during an Assembly of God rally. That starts the backward aging miracle that gives Button the epic life. I once saw the “laying on of hands” at a revival at the Brownsville Assembly of God in Pensacola Florida in November 1998. When I recovered from my own acetabular fracture (hip) over two months in 1998, I sort of experienced reverse aging, as I got back to life. I remember shedding the crutches as a convenience store (after a small speaking engagement) on a Sunday afternoon, a few days after a major speaking engagement while on the crutches. Three weeks later, I went to the Minnesota AIDS Project Academy Awards Party at the Orpheum Theater on Hennepin in Minneapolis and shed the crutches for the whole evening. It was wonderful, one of the best experiences of my own curious life. I suppose my titanium plate could attract lightning strikes, just like the codger (with dementia) in the movie, who says (7 times) he has been struck by lightning seven times. Eventually, Button, as he ages backward into infancy, doesn’t remember his epic life or who he is because he has become a tabula rusa, essentially nothing without parents to build him back. Like a baby who cannot thrive, he dies in the arms of his former love in a special needs home. I saw the film in a large AMC Auditorium in Arlington VA on a Monday night, 7 PM show, and it was about half full, very good for a weeknight. The film is distributed by Paramount in the USA and Warner Brothers elsewhere. Paramount has tried a neat experiment with its trademark. 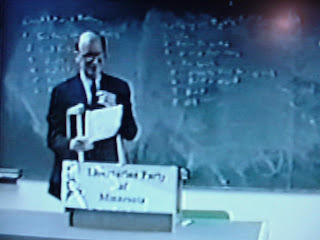 Picture: Me, lecturing at Hamline University, St. Paul, MN, Feb. 25, 1998. The crutches were nearby. I actually got a speeding ticket driving "home" that night.